The Protech-1Hydraulic Steering Kit is all you need for a complete steering system. 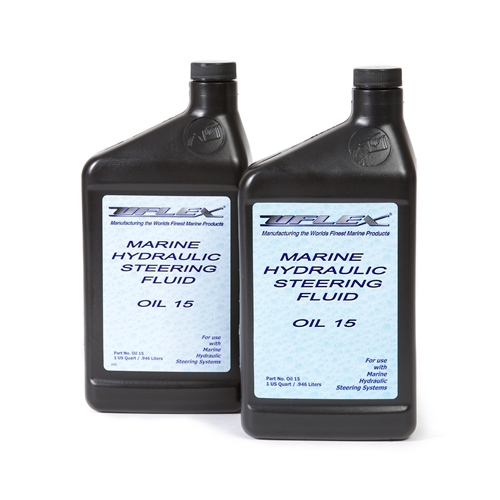 This packaged Kit includes: 1-UP28F Helm Pump. UC128-OBF1 Front mount Hydraulic Cylinder & 2 quarts Oil-15 Hydraulic Oil. See Cylinder Guide for correct cylinder application. Installation and Instructions manual. Steering wheel not included. Does not include hoses. 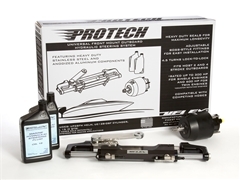 Protech 1 package kit contains: UP28 F Front mount helm pump. UC128-OBF 1 Front mount outboard cylinder. Specify engine type when ordering. Protech-1 - with UC128-OBF/1 cylinder OIL 15 Hydraulic oil - 2 quarts. KIT OB Optional Hose kit with preassembled fittings. Specify length required when ordering. 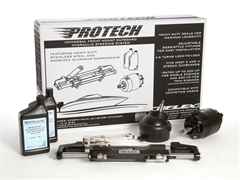 Durability and performance define the Protech front mount outboard steering package. From the stainless steel helm shaft, heavy duty shaft seals, carbon steel piston and 304 electropolished and passivated stainless link assemblies, the Protech is built for maximum longevity and peak performance. Adjustable boss style fittings allow precise hose routing without the risk of breaking the fittings by overtightening or leaking fittings from loosening during installation, a common problem on competing cylinders. 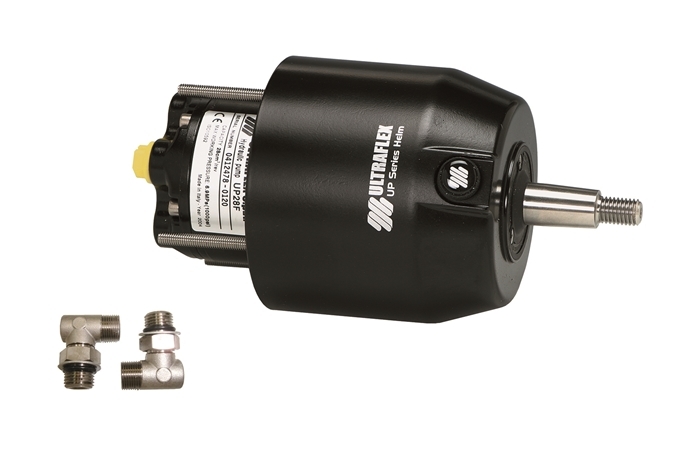 See Cylinder Guide for correct cylinder application. Installation and Instructions manual. Steering wheel not included. Does not include hoses. This Protech Hydraulic Steering system was easy to install. The hardest part was getting the new hoses pulled through the gunnel area of my Triton bass boat as there was no easy access. After install I bled the system and wow! Never will I use cable steering again. Thanks BS for your help with this system for my boat. Fast shipping after I placed my order and all the parts arrived as described.